When I was in high school, I was kind of a nerd. Granted, I didn’t wear glasses or perform in Renaissance garb at my talent show, but I certainly wasn’t in the popular clique. Instead, I found most of my friendships in the drama club and choir class. We sat in the courtyard outside of the drama hallway every day during lunch. Those were my people, and I felt comfortable being in their presence because they accepted me for my love of Broadway musicals and I accepted that they would sometimes get loud and crazy and maybe burst out into Rent. When I went to class, it was a bit different. I think one of the most unique aspects about my high school experience as a whole was that I wasn’t popular, but the popular kids – or at least some of them – seemed to accept me and others like me. I took quite a few AP classes in high school and the “popular clique” seemed to have its members scattered throughout those classes. I’ll never forget the moment Cyndel – one of the head cheerleaders – sat beside me in AP Psychology. We became friends that year. She had been in another AP class of mine the year prior and though she knew I wasn’t one of her own “kind,” she was still friendly. The day she invited me to a party was the day I felt like I actually MADE it. (I didn’t go because I was, am, and always will be a goody-two-shoes, but the fact that I was invited by one of the “popular” kids made me feel included.) Cyndel and I were never truly close, but she did write some nice things in my yearbook and for the hour or so that we were together in class, we pretended like our cliques didn’t exist. I know what it feels like to want to be included because you’re a nerd, and I’m here to tell you that this particular feeling – at least thus far in my life – has not waned. Everyone wants to feel that they belong to someone, that they’re meant to be SOMEWHERE. Human beings were meant to be relational, for community, and to be included. That’ll always be truth. So in “Nerd,” we see a rare side of Jess – a side that feels insecurity. I’m so used, as a viewer, to seeing crazy, fun, weird Jess who loves that she rocks polka dots and ribbons and her giant glasses traipse around my television screen. But it’s easy to forget that television characters are human beings, and in this episode, our title character struggles with feeling lonely in her new school. Elsewhere, Schmidt is attempting to balance a relationship with both Cece and Elizabeth (we’ll get to that whole storyline in a bit, don’t worry), while Winston is trying to take care of Daisy’s cat. And by “take care,” I mean it in a very mobster sense. Now, let’s dive into the episode then, shall we? “Nerd” opens with an important question uttered by Winston: does anyone know anything about cats? As it turns out, Winston volunteered to watch Daisy’s – the young woman who he’s about to ask to be his exclusive girlfriend –cat, Ferguson, while she’s away. What I really love about what the writers have decided to do with Winston is this: they have chosen to make him (pardon the pun from last week’s episode title) “all in” with whatever he does. Sure, his gung-ho nature involving puzzles and pranks is odd, but the fact of the matter is that in “Nerd,” Winston wants to put everything that he has into his relationship with Daisy. In the second season, we saw Winston’s relationship with Shelby fizzle out because he was complacent – because he merely coasted. And this is an important personality trait that Winston possesses in “Nerd” as well. His desire to hit the cruise control button on his relationship with Daisy is ultimately the thing that drives him crazy. It’s only when he realizes at the end of this episode that he deserves MORE than just coasting that he is finally able to break free. Jess is attempting to look her best for her day at school and Nick is trying to help her fix her bangs in the mirror (girl, I feel you on the impossibility to get those things looking perfect). It’s then that Jess admits her true problem to Nick: she’s been at her new school for a week and hasn’t made any friends there yet. Apparently, there are three “cool” teachers that formed a clique and Jess has been excluded from the group. Nick – the person who likes to TRY and fix things, usually unsuccessfully – decides that he’s going to help his “old lady” get in with the cool crowd at school. I think that it’s extremely endearing that Nick goes to great lengths to help Jess in the episode, while also remaining completely true to himself as a character. Last week, I discussed the dilemma that series often face in deciding whether or not to place a couple with chemistry together. But when a series DOES take that leap – when they choose to place two characters together – a new issue arises: how do you keep the characters true to themselves while still being romantic? The biggest pitfall for a series that decides to put two of its characters together is this: the relationship dives into oversentimentality, schmoopiness, and general unbelievability. But what I loved about this episode of New Girl (and what I love about the Ben/Leslie relationship on Parks and Recreation and the former Jim/Pam one on The Office) is that it proved to me that the writers could make Nick and Jess functional in a relationship without losing the individual components that made them hilarious as characters and friends. Apart from some lines of dialogue and a kissing scene, “Nerd” hinges on the Nick/Jess friendship. And that relationship – the one where she goes to him for advice and where they banter and where hijinks ensue – is one of the strongest elements in this series. Nick gathers up what little money he has (including the torn half of a dollar) and decides to buy school supplies to bribe the cool clique teachers with. Meanwhile, Schmidt is dealing with his own identity issues: he’s been attempting to juggle relationships with both Cece and Elizabeth and the lifestyle is taking a toll on him. There’s the classic sitcom staple at work here of a “snowball effect” which, of course, leads to hijinks and shenanigans. At work, Schmidt gets to move away from his irritating co-worker Beth and into his own office (the woman is jealous and spiteful, as evidenced throughout the rest of the episode). Realizing that Schmidt is trying to juggle two relationships, Beth invites Elizabeth to their office party on behalf of Schmidt, knowing that he had already invited Cece. I’ve had conversations with friends recently about Schmidt’s behavior in the season premiere and also “Nerd.” As I mentioned throughout my review last week, I don’t believe that the Cece-Schmidt-Elizabeth cheating triangle is meant to evoke sympathy or acceptance in the viewer. We’re not meant to find Schmidt endearing, nor are we supposed to like him. And I think that baffles viewers, to be honest. We’re unsettled when we are forced to dislike, distrust, or even downright hate a character we liked or tolerated previously. "[…] in every situation I mentioned, there has always been someone there for Annie to talk her away from her ledge of control and perfection. She may not always listen initially, but those people serve to remind her of what is right and true. In every example I listed above, Annie was willing to sacrifice something of value (her standards, ethics, values, reputations of others) in order to win or to get a good grade. This IS a part of Annie’s character, and you can ignore it and pretend it doesn’t exist. […] the truth is that Annie does not always do the right thing. She lets her better judgment become overwhelmed by her desires and that means she is human. But notice that in EVERY circumstance, Annie feels remorse for her behavior. She doesn’t continue to defend it once she knows she is in the wrong. So why is her secret so shattering to people? Because of the truth that there was NO one there to stop Annie from acting on those drives and desires that usually allow her to do the right thing." I was reminded of this portion of my article when I was contemplating Schmidt’s behavior, because I feel the two are quite similar in this regard: both individuals know what is right. Annie knows how she needs to respond, and Schmidt knows he cannot keep cheating on both Cece and Elizabeth because it’s destroying them, himself, and people around him. Annie and Schmidt both consistently seek the advice of those around them. Annie, as I mentioned in my post, needs Jeff present in order to talk her away from the ledge of crazy most times. Schmidt needs the advice and direction of his best friends and – in particular – Nick. Schmidt wants someone to tell him to do what he already knows he NEEDS to do but no one is. And that's not on NICK by any means, but it's a clear indicator that Schmidt isn't the type of character who has his life together. He's asking NICK for advice. And he NEEDS to grow up and make hard choices, but his default setting is to be a douchebag (remember that this behavior is typical of him, since he is – after all – the reason for the jar) to the people he cares most about in his life. What Schmidt doesn’t realize completely, but started to in “Nerd” is this: actions don’t just have consequences for those involved. The effects of bad decisions are far-reaching. The reason that we are frustrated with Schmidt – the reason some people hate him – is because we are meant to feel this way. Liz isn’t condoning cheating, nor is she – like I mentioned earlier – expecting us to accept that what Schmidt is doing is somehow right or funny. In fact, she is, if anything, saying: "Look at what this situation is doing to him, as a character.” When you force Schmidt make decisions without his friends’ guidance, he makes BAD ones. And it's not okay that he does. Nevertheless, Schmidt’s decisions DO involve hijinks (a classic sitcom cliché that gets turned on its head, brilliantly, at the end of the episode), as he attempts to keep both Cece and Elizabeth apart from one another for the evening, with Beth acting as a middle-woman who is trying to sabo (that’s short for sabotage) Schmidt’s plan. Meanwhile, Nick’s plan to get Jess on the clique’s good side goes exceptionally well: he invites them all to his bar for free drinks later on that evening. While there, Jess is trying her very best to connect with the clique but she’s far too nice for their taste and they begin to slowly shut her down. Nick’s advice? Drink. Drink and make fun of her boss with them because THAT, he insists, is how she will be cool. 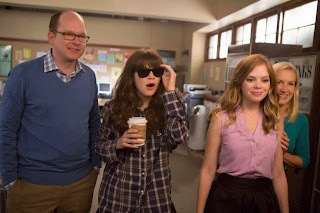 So, Jess follows Nick’s advice and gets completely drunk, has a lot of laughs with her new teacher friends, and then… is hungover the following morning. In the midst of all the chaos, Winston broaches the topic of exclusivity at Daisy’s apartment while she’s attempting to pawn off her cat on him. It’s then that Winston realizes exactly WHY Daisy is being so rushed with him: there’s another guy in her bathroom. Winston is obviously hurt by this revelation, and it pains me because he’s determined to take a step in the right, mature direction and then is sent into an insane spiral of regressive behavior because of Daisy’s selfishness. (That’s what you get for leaving New Girl to be on Dads, Brenda Song!) So Winston’s solution for vengeance is pretty simple: he’s going to kill Daisy’s cat. Nick forbids this from happening and instead explains that the only proper way to get over Daisy and get the closure he needs from the relationship is to break up with her instead. Winston, however, seems intent on choosing HIS coping mechanism because… well, let’s be frank here: sometimes it’s just easier to kill a cat (metaphorically guys, I MEAN METAPHORICALLY) than break up with someone. It’s easier for Winston to project his pain and anger onto something than it is to actually face the person who caused the hurt in the first place. There’s this really wonderful Schmidt moment though that occurs right before the boys jump onto the bed and begin singing. Schmidt (and Winston) are both concerned when they notice Jess passed out on Nick’s bed, obviously hungover and also obviously running late for her job. When Nick explains that she just decided to have fun and fit in with the other teachers by drinking, Schmidt chastises Nick for projecting too much of himself onto Jess. The man explains that since Nick is now Jess’ boyfriend, his job is not to encourage her in doing stupid things but to protect her from doing those things in the first place. There’s this obvious moment where Nick becomes frustrated and defends himself, saying: “I AM protecting her. She’s my old lady now.” In truth, Nick had the best of intentions with Jess (as he oft does). His execution, however, went awry when he told her to try and fit in by being someone other than who she is. After all, isn’t it the weird, quirky, random Jess the one he ended up growing to care about? The scene is so understated but so brilliantly performed by Jake Johnson, and you can tell just how much Nick truly does want to protect Jess. The title character of our series becomes one of the teacher clique members (and as a reward, gets access to the secret cabinet of coffee mugs – AWESOME) after her drunk antics at the bar the previous night won them over. Things only begin to go awry when Jess continues her pursuit in being accepted into the circle by agreeing to break into their principal’s backyard. Nick attempts to dissuade her from participating, but she’s insistent and uses his earlier story against him. It’s easy to relate to Jess in this episode, if we’re honest. She’s always been singled out as the “quirky” and “weird” character in the loft, so we can only presume that others at her workplace have viewed her the same way. And now? Well, now after a week of eating lunches by herself, of ducking her head in the hallway, Jess is finally a part of a friendship. She’s not lonely anymore. Because the truth of the matter is that within all of us still exists that nerdy high school student (if you were one). And when we’re thrust into a situation where we feel isolated, lonely, and where everyone around us seems to have a friend, we automatically BECOME that teenager again. We may be twenty-five, with a 401k, a successful relationship, and an apartment but when there’s a clique and you’re excluded? It hurts, no matter how much we pretend otherwise. And Jess expresses this to Nick: she knows that she was a nerd in high school and affirms that if they had met back then, he wouldn’t have even noticed her. But she’s getting a second chance at being noticed by the clique of teachers, and she’s not about to sacrifice that. Nick – hilariously – is the one sane adult in the apartment this week, and he attempts to convince Jess not to break into her principal’s backyard while also forbidding Winston from hurting Daisy’s cat. In the end, when Winston does move to destroy Ferguson (and really, Daisy)… he can’t. He looks into the cat’s eyes and realizes what we’ve known since the start of the episode: it was never really about the cat. And the only way he can truly move forward is if he confronts Daisy about her actions. As it turns out, Daisy WAS cheating on Winston. And while this leaves him broken, HE musters up the courage to break up with her. He refuses to coast because he knows he deserves better in life than someone who disregards him. At Schmidt’s office party, Elizabeth and Cece have managed to avoid one another all night (not due to lack of trying on Beth’s part) but eventually spot one another across the room. Schmidt lies to Elizabeth and tells her that Cece is a waitress at the party. And, since Schmidt lied to Cece and told her that it was an employee-only gathering, she dons the apron and pretends to be a waitress. (Elizabeth, it is explained to Cece, works for the company. And this is successfully conveyed when Elizabeth adopts Schmidt’s suggestion that they role play throughout the evening. By the end of the night, both women have seen one another, though neither suspects that the real reason for the attendance was to be Schmidt’s date. Beth approaches Schmidt after the party ends and both women depart and dead-pans her congratulations. But it’s more than a snide statement because she “lost”: Beth recognizes Schmidt’s pain and her statement comes across more as a warning than anything else. New Girl breaks the sitcom trope by ending the episode with Schmidt actually succeeding in pulling off his scheme. But then the show does something: it reminds us that success in deceit is no success at all. Max Greenfield then does what only he can do in his portrayal of Schmidt – he watches Beth leave and then blinks away tears, remorse settling over his features. Again: I don’t particularly enjoy this storyline, essentially because I don’t enjoy stories where characters cheat on others. I know that I’m not Schmidt’s greatest fan but the beauty is that I don’t HAVE to be. I’m never asked to cheer for him or root for him. And the remorse at the end of the episode isn’t inserted so that we will somehow feel more acceptance toward Schmidt as a character or his actions. It simply exists to spin the cliché on its head and remind us that this two-timing behavior is neither without consequence nor emotion. Back in the A-story, Jess and her new friends sneak into their principal’s backyard. Actually, only Jess sneaks in and is followed shortly by her boyfriend. He explains the nature of their relationship to her in a nutshell: “If you’re gonna do something that’s obviously very stupid… then I’m gonna do it with ya.” That’s the beauty of Nick and Jess as individuals and as a couple, isn’t it? They’ve ALWAYS – from long before their relationship was ever on the table – had each others’ backs. They go to one another for advice and support and are there for whatever silly scheme happens to be occurring that week. Nick realized that Schmidt wasn’t necessarily right: while the former told Nick to be more responsible and rein Jess in when she attempted to do crazy things, Nick recognized that this isn’t really what caring about someone and caring FOR someone means. Instead, he explains, caring about and for someone means that you’re not at arm’s-length from them. You are right there BESIDE them in their craziness, because that is the best way to protect the people you care about. It’s an adorable sentiment, complete with a heart-warming smile… that becomes interrupted when Dr. Foster’s alarms begin to sound. It’s then that Nick protects Jess by shoving her into the bushes. But she can’t let her boyfriend take all the heat and confesses that they snuck into his backyard. Dr. Foster assumes that they wanted to use his jacuzzi and… then Nick and Jess have to pretend that this is the reason they did, and end up in another Remy-like situation. The next day, Jess is approached by her teacher clique and they encourage her to join them for more wild shenanigans that afternoon. Jess passes, saying that she plans to hang out with her “old man” instead. And as the teachers leave, a bit befuddled, we – and Jess – realize that Nick is the person who truly cares the most about her well-being and has proved that consistently. He’s her old man and she’s his old lady. And as much as she may want to have friends, Jess realizes that the way to make them is to be exactly who she has always been, because that was good enough for Nick, Winston, and Schmidt. Outside, Nick is leaning against the hood of a car, playing (using that term loosely) with a hacky sack. And then, because he’s Nick Miller and I’ve been conditioned by New Girl to swoon at everything he says, he looks down at Jess and calls back their conversation from the day prior about how she believed he wouldn’t have noticed her in high school. With the words: “I just wanted to say… I would’ve noticed you,” every woman – including Jess – swoons like we’re at the end of a 90s romantic comedy. The question of identity can really be answered in one of four ways: who you’ve been (Nick), what you do (Schmidt), who you want to become (Winston), and whose you are (Jess). Most of these characters faced an identity crisis this week which left them and us wondering exactly who they were. And while it may be frustrating at times, I think there’s a certain joy in the unknown – in not knowing exactly who you’re meant to become. It means we have the freedom to do, to try, and to mess up. It gives me comfort to watch a series where broken people meet other broken people and try to make their messy lives better. Because really, is there anything more human than that? Schmidt commenting that he's never seen Nick this happy? I died. "You guys trying to steal my swag." "I wouldn't even know how to begin to steal a swag." The entire elevator gag was PERFECTION. "I have a 5 AM conference call with... the Asians." "Drinking to be cool, Nick? That's not a real thing." "That's the only thing in the world I know to be true." "An eye for an eye, Nick. And a cat for a cat." "But what's the other cat?" "My heart."